The dif file extension is mainly known for its use for spreadsheet files saved in Data Interchange format. Data Interchange Format, also known as Navy DIF, is a text file format used to import/export single spreadsheets between spreadsheet programs (OpenOffice.org Calc, Excel, Gnumeric, StarCalc, Lotus 1-2-3, FileMaker, dBase, Framework, Multiplan, etc.). The .dif file is a workbooks, with the limitation that single workbook contains only single spreadsheet. These files were originally used by VisiCalc. 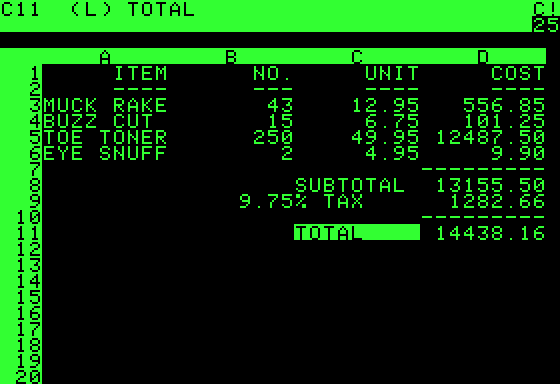 VisiCalc was the first spreadsheet program available for personal computers. It may well be the application that turned the microcomputer from a hobby for computer enthusiasts into a serious business. Most current spreadsheet programs are able to work with *.dif files. Whilst DIF spreadsheets were mostly used in the past, some programs still support it and can import data from them. Click on the tab below to simply browse between the application actions, to quickly get a list of recommended software, which is able to perform the specified software action, such as opening, editing or converting dif files. Programs supporting the exension dif on the main platforms Windows, Mac, Linux or mobile. Click on the link to get more information about listed programs for open dif file action. Programs supporting the exension dif on the main platforms Windows, Mac, Linux or mobile. Click on the link to get more information about listed programs for edit dif file action. Programs supporting the exension dif on the main platforms Windows, Mac, Linux or mobile. Click on the link to get more information about Corel Quattro Pro for convert dif file action. Programs supporting the exension dif on the main platforms Windows, Mac, Linux or mobile. Click on the link to get more information about listed programs for create dif file action. Click on the software link(s) for more information. Suggested software applications use dif file type for internal purposes and/or also by different way than common edit or open dif file actions (eg. to install/execute/support an application itself, to store application or user data, configure program etc. ).